Gone are the days of certainty. In order to stay competitive companies must constantly innovate, adapt to changing market conditions, and deliver value to their customers faster than ever before. As a result, many organizations are embracing Agile principles and practices, which are highly collaborative, iterative and focused on delivering maximum value to customers. Continuous Learning – determine the appropriate Agile learning path for your teams. For those just starting out, introduce the Agile Values and Principles and make parallels to the culture and behaviors your organization values. Adapting Leadership - rethink the role of the manager. Consider moving from a command and control approach to servant leader/ coach. Leaders should focus on coaching and removing impediments. Empowering Teams – teams that are given clear direction and outcomes should be empowered to determine how they will work to achieve their outcome. This autonomy will drive higher levels of creativity and engagement, and if done right, deliver maximum value to customers. Adapting Performance Feedback – consider moving away from “traditional” annual reviews to more frequent feedback and faster feedback loops. Individuals and teams can adapt more quickly and apply learnings to improve work. Provide tools and techniques that empower employees to take ownership of their development. Rewarding Agile Behaviors – evaluate programs to ensure they reward the behaviors and mindset you value. In an agile environment, teams work collaboratively, consider rewards that promote teamwork and collaboration, or recognition for continuous learning, and rewards for delivering value to customers. A one size fits all approach may not be appropriate. Reshaping Talent Acquisition – hire for culture fit and mindset and make this a priority. Working in an agile environment is not for everyone. 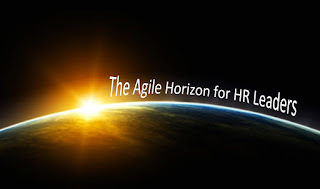 In addition to focusing on programs that drive agility, HR as an organization should embrace new ways of working that reinforce the Agile Values and Principles. First, educate yourself and don’t be afraid to experiment and try new ways of working within your HR team. For example, if you’re considering the idea of Self-Organizing teams, consider experimenting within your team. You will become more knowledgeable and better equipped with first-hand experience to help guide, coach and facilitate the organization in their journey to become agile. As you think about adapting your programs, consider using Open Space Technology. Open Space is a great way to gather feedback, ideas and insights from your employees that can inform how you design programs for your teams. This approach promotes collaboration. If you plan to change or modify one of your existing programs, consider breaking this work into small increments to avoid delivering a “big bang” fully baked program which may not meet the needs of your customer. If you plan to move away from “traditional” performance management in favor of real-time continuous feedback consider starting with one team, educate them on the value of real-time feedback and then train them on how to give and receive feedback. Gather their feedback and iterate as needed and then begin to scale the program. In addition, start connecting to customer value. Consider creating a compelling purpose that is focused on customer value. Strive to keep the (external) customer front and center by linking your programs to the value they will bring to the customer. Empower your employees to make decisions that are customer centric – this shift may mean that you change how you compensate or incentivize your employees by moving away from performance metrics that are internally focused in favor of rewarding behavior and actions that delight the customer. Strategic HR organizations have expertise in helping companies achieve objectives through focus on organizational culture and high-performing teams. Given this capability there is a natural role for HR to play in an Agile culture. HR has an opportunity to become Agile coaches and change agents. Embrace and ready yourself for change. This may be the new horizon for HR. Mario Moreira writes more about Agile and HR in his book "The Agile Enterprise" in Chapter 21 "Reinventing HR for Agile"